When considering transport services in Hermanus, the great thing about Eastbury Cottage is that most things are within walking distance. However, there are some places that are a little out of the way – like the suburbs of Vermont, Onrus, Sandbaai, Hemel en Aarde and Voelklip for example – that may need you to hire transport. In this blog article we mention transport services in Hermanus and the surrounding area with contact telephone numbers to make it easy for you to get in touch with the relevant tour, shuttle or car rental companies. Getting transort to Hermanus from Cape Town International Airport is easy with our shuttle services that run virtually every day at any time. Bookings have to be made and the prices will vary according to how many passengers are in the shuttle, the time and date of the trip and the company you use. Every shuttle service is extremely efficient, however, and will ensure you a safe trip in and out of our town. 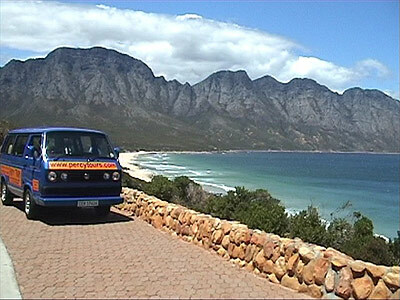 Some of the available shuttle and transport services in Hermanus are Whale Coast Tours (Andre Pietersen email: info@whalecoasttours.com, mobile: +27 (0)824374838) the Baz Bus (+27 (0) 21 4392323), Percy Tours and Transfers (+27 (0)72 0628500), Shuttle Away (+27 (0)76 8326729) and Splash Shuttle and Transfers (+27 (0)28 3164004). For larger groupsof up to 17 persons, Nkosi Safaris shuttle is run by Christo du Toit. Call Christo on +27 (0)28 3141876 or email at nkosisafaris@gmail.com. Hermanus also has a number of car rental places that are guaranteed to give you a great deal on a car that will best suit your needs. Terms and conditions and prices vary from place to place but the underlying good service stays the same. And, as previously mentioned, you won’t have to do a lot of driving once you’re in the CBD of Hermanus because everything is so close. Three reputable companies for car rentals in Hermanus are Avis Car Rentals (+27 (0) 28 3164180), Hertz Car Rentals (+27 (0) 28 3124479) and Budget Car Rentals (+27 (0) 28 3130526). Bizzy Car Hire and Vineyard Car Hire are further suggestions for car hire services in the Western Cape. Hermanus Cycle Centre also loans out bicycles to those who wish to get around in a slightly different style: call them on +27 (0) 28 3132052. Hermanus Cycle Centre also supplies mountain bike trail maps. Lastly, there is even a solution to getting around within Hermanus if walking isn’t your forte and you don’t want to rent a car. The Tuk Tuk transport service of Hermanus offers you a lift anywhere at any time. The Tuk Tuks can seat up to six people and the cost is determined by how many people are in the Tuk Tuk and where you want to go. Trips from the CBD to Grotto Beach and back, for example, are only R65 and the nature of the business means that you can set the time for collection on both points. 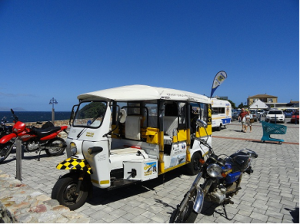 The Tuk Tuk service is fully licensed and fully capable and bookings can even be made on the day before 21h00 on weekdays and weekends before 02h00. Call +27 (0) 84 6885885 for bookings and quotes and get ready for a fun, reliable lift to and from wherever you need to go, whenever. During the summer months and the Whale Festival especially there are also bicycle-trams that offer lifts around the Central Business District (CBD) just in case you have too much shopping or just want to cruse past the ocean and see the whales in style. Transport suppliers listed hereunder are accredited members of the HTB and have met the minimum required statutory requirements in the interests of your safety. With all these options it won’t be getting here or getting around that you have to worry about; it will be getting yourself to leave this breath taking town that will be the problem!